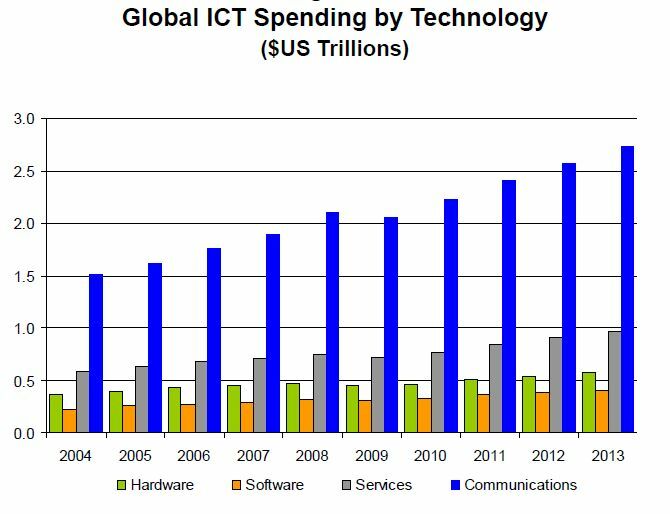 This week my undergraduate class at KAIST, entitled "Introduction to Mass Communication" is looking at the game industry, both globally and Korea's role in it. I was surprised when one of the students asked me to explain why we were studying online games in a course on "mass communication." A good question and it is worth being explicit about the answer. First, I think there is a good argument to be made (it already has been by many scholars) that the era of mass communication took place in the twentieth century and is over. 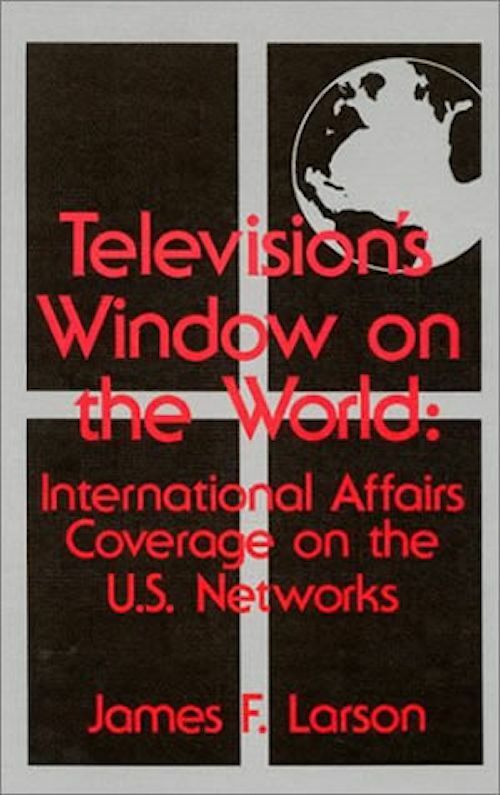 The data show that, all over the world, people are spending less time watching television or with other traditional "mass media" pursuits and more time online. The online experience is decisively different from "mass" communication and nowhere is this more apparent than in the online game industry. Second, the game industry, including online games, arcade games, video games (as in Nintendo, Sony and Microsoft X-box) and most recently mobile games) are part of the entertainment industry. As digital technology, the internet and cloud computing continue to develop, online games are converging in some ways with both television and the motion picture industry. If you doubt this, view the following trailer for the new version of World of Warcraft. 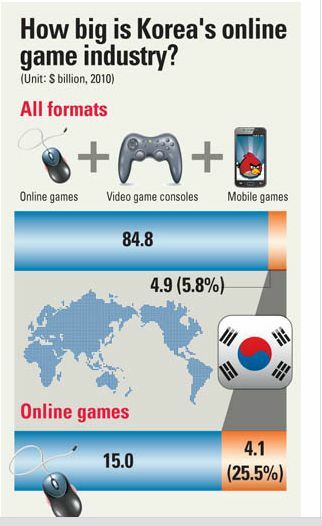 Third, as we discussed in our Tuesday class meeting, Korea has a big stake in the game industry, as illustrated in the accompanying graphic that was published in a December 2011 Korea Joongang Daily article. (click on the graphic to see a full-size version). The title of that article, "E-sports spread from PC Bang to world stage" hints at the answer to my student's question about why the game industry is becoming part of media today. So there you have it. Participation in a multiplayer online game, whether at home, at a PC Bang, or while riding home on the subway, is not really "mass communication," or is it? Comments welcome. In recent years I have posted on occasion about the phenomenon of South Korea's internet cafes, known here as PC Rooms or PC Bang in Korean. Last July, I took note of the declining numbers of PC Rooms. Just this past week, The Korea Times carried an article that elaborates on the decline of PC Rooms. The article notes that "A recent survey on Internet cafe owners by the Korea Federation of Small and Medium Business showed that 64.5 percent of them have been in deficit for the past year; one out of three was barely breaking even, and only 1.8 percent saw a profit. Six out of 10 said their business seemed in bad shape, and 34.5 percent said it was very bad." Then, as I suggested last year, the article goes on to document mobile games and the arrival of the smartphone era in Korea as major reasons for the decline. Indeed, we might suggest that the decreasing popularity of PC Rooms here is another aspect of the so-called "smart-phone shock" that has rippled through South Korea's market since the arrival of the iPhone in late 2009. 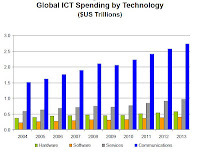 The graphic accompanying this post is an updated version of one published in my book with Dr. Myung Oh, Digital Development in Korea: Building an Information Society, (click on the graphic to see a larger version). I have not yet been able to find the data for 2009, although it appears that the number of PC Rooms began to drop sharply that year. Note also that the peak number of PC Rooms, 22,548, appears to be correct based on multiple white papers published by the Korea Game Industry Association. 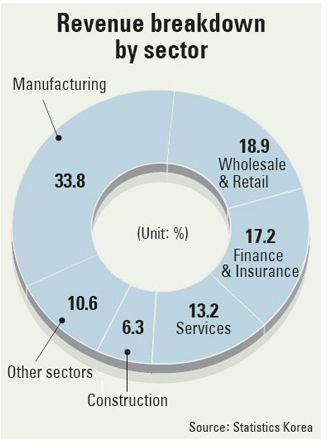 (I mention this because the graphic from the Joongang Daily article last July has a different figure, 23,548 and may have been a typo). A tip for smartphone users learning Korean: Use Google translate! Like many expats in Korea, I've been struggling to improve my command of the Korean language. It will, of course, be a lifelong struggle. However, Google Translate, the subject of earlier posts here, has taken a giant leap forward with the release of its "voice-to-voice" translation service. This morning I downloaded the Google translate App for Android to my Galaxy Nexus phone and was delighted to learn that the voice-to-voice translation service is up and running for Korean to English or English to Korean translation. This is really a 21st century service. Basically, you just open the app, adjust a few settings and then speak the word, phrase or sentence that you want translated, after which you touch the speaker icon on your phone to hear a woman utter the translation in either English or Korean. It gets even better..... in "conversation mode" you can view the text of the translation even as you're listening to it being spoken. Of course, the translations are not always perfect, and Google translate still works better for simple words and phrases than more complex expressions. Nevertheless, this is a tool that gives a glimpse of things to come! If you haven't tried it, I recommend installing the app and starting immediately, as an enjoyable supplement to more rigorous study of Korean. As readers of this blog will be well aware, mobile telephony has gradually been spreading in North Korea, mainly through the efforts of Orascom, but also, according to many anecdotal reports, use of Chinese mobile services whose signals reach into North Korea along its border with China. The Telegraph has published an article that provides some interesting, current detail on how clandestine mobile phone calls are being used by North Koreans who have fled to the South, to communicate with their relatives and others inside North Korea. Entitled "What North Koreans really think of Kim Jong-Un," it is well worth reading.